Decorative Foam also known as architectural foam is a cost-effective alternative to wood, plastic, and is lightweight, moisture-resistant and suitable for interior and exterior use. Decorative Foam is an excellent choice when it comes to a more affordable alternative to decorate your home or office. Ebie Construction specializes in professional application of decorative foam material. The great thing about decorative foam crown molding is it does not cost nearly as much as traditional crown molding made of wood. With a wide variety of decorative designs, you can definitely find the look you want. Decorative Foam Crown Molding installed by Ebie Construction will definitely have your guest fooled for much less. Give your home or office the look it deserves, don’t hold back from letting your home or office have an elegant look and feel because of budget restraints. 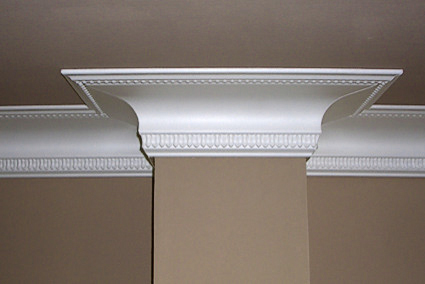 Professional Decorative crown molding can give your home or office the same exact look and feel at a much more affordable cost. Just recently because of the economy many residential and commercial property owners are looking for a less expensive and more affordable way to decorate the exterior section of their home or office. Have you recently seen the stone pillars and walls at the new shopping center nearby, or maybe the exterior stone look to a neighbors home? You like the look but figured the cost was just not attainable. Ebie Construction can deliver the same great look at a much more affordable price. Create durable, safe walls from high-density foam that give the realistic appearance of brick, stone, bamboo, tree bark and many other types of textures. These high-density foam panels by Ebie Construction are meant to be sawed, cut, drilled, and installed to customize your home or office. Call today for a free no obligation consultation for your home or office.